Family is in our name and that is exactly how we want you to feel about us. We are a tightly-knit group at Jerman Family Dentistry. We work well with one another because we, collectively, have a desire to deliver only the very best care to our patients. We understand that creating a positive and caring work environment ensures a relaxed and enjoyable visit for you, the patient. A Fresh Approach to Family Dentistry. 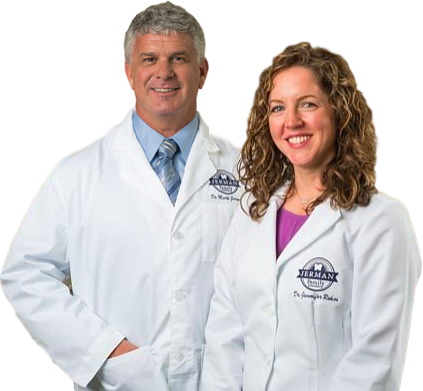 Our office has two very talented general dentists, Dr. Mark Jerman and Dr. Jennifer Rekos. Our caring staff prides itself in providing the highest quality treatment in cosmetic and restorative dentistry at our state-of-the-art facility. Dr. Mark Jerman is following in the footsteps of his father, Dr. Steve Jerman, who founded this practice in 1967. Dr. Mark takes immense pride in helping families enjoy their smiles. We ensure coming to the dentist is a comfortable and satisfying experience for all. Jerman Family Dentistry has a small, friendly atmosphere that will immediately put you at ease. We are conveniently located in the heart of Worthington and serve patients from all over Central Ohio. Our professional staff values you. We want you to feel comfortable as we strive to provide the highest standard of personalized dental care in the most gentle, efficient way possible. Our patients know that their healthy smile is our main focus. We have the knowledge and technology to create a treatment plan for any mouth. We will help you obtain the smile of your dreams. Services we offer include CEREC one-visit crowns, cosmetic bonding (white fillings), cosmetic/porcelain veneers, cleanings, implants, dentures/partials, digital intraoral photography, oral cancer screenings, whitening and tooth colored fillings/restorative care. Thank you for visiting our site, we look forward to serving you!